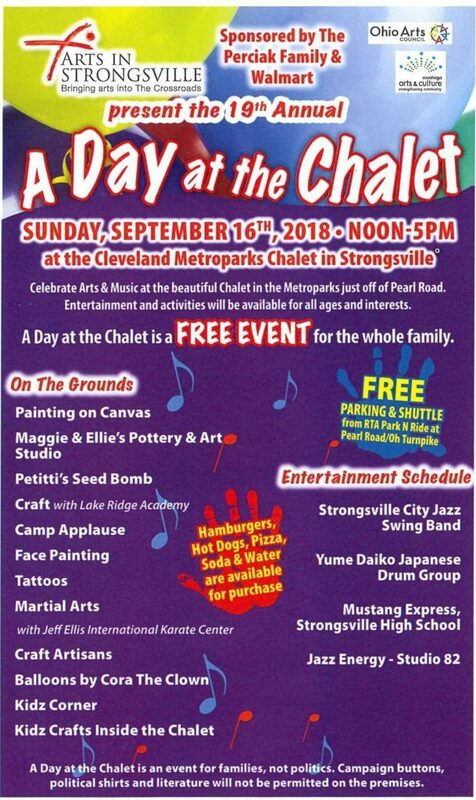 Arts in Strongsville presents its annual Day at the Chalet, a free outdoor art festival focused on family fun, from noon to 5pm Sunday, September 16, 2018 at the Cleveland Metroparks Chalet on Valley Parkway between West 130th and Pearl Road. A Day at the Chalet is an outdoor Art Festival that provides a venue for children and adults to interact with varied artists and to participate in collaborative art projects and to practice their own skills. Entertainment will be provided on stage. Arts and crafts will be provided for children on the grounds along with face painting and tattoos. Crafters will be on the grounds selling their wares. Any crafter that is wanting to participate at this event must contact Cindy Baldin at 216.973.1488. Volunteers are needed to put on this event. Contact Amy McEntee at 216.973.0844 if you can help volunteer. This is a FREE EVENT and all are welcome to attend. Food will be available at a nominal fee. Arts in Strongsville provides fine arts activities for children ages 4-12 during one week of the summer in conjunction with the Strongsville Summer Camp. Each camper participates in music, art, dance, and drama classes. This year’s camp theme was “Route 66.” While taking a trip down the “Main Street of America”, the children learned about its attractions and historical significance. Their vacation out West included creating license plates, learning traffic rules, completing a scavenger hunt, and performing a song and dance about the route. Firemen and Policemen were acknowledged and honored for the safety they provide for our community on the final day of camp. They were given treats for their departments and collaborative art projects were made by the students during class. Here is a video that documented all of the kicks that the campers got out of Route 66! All are welcome to join us at our 8th Annual Chalk Walk to be held on May 19, 2018 from 10 AM to 1:00 PM at the Strongsville Commons which is at the corner of Rt. 82 (Royalton Rd) and the corner of Rt. 42 (Pearl Rd). In case of inclement weather the event will be cancelled. 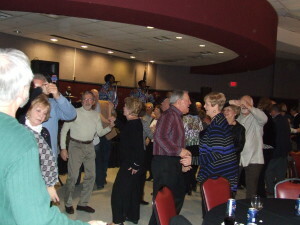 There will be 7 categories that will be judged for prizes and ribbons and there will be three winners in each category. Children ages 5 to High School Seniors are able to participate from any community. 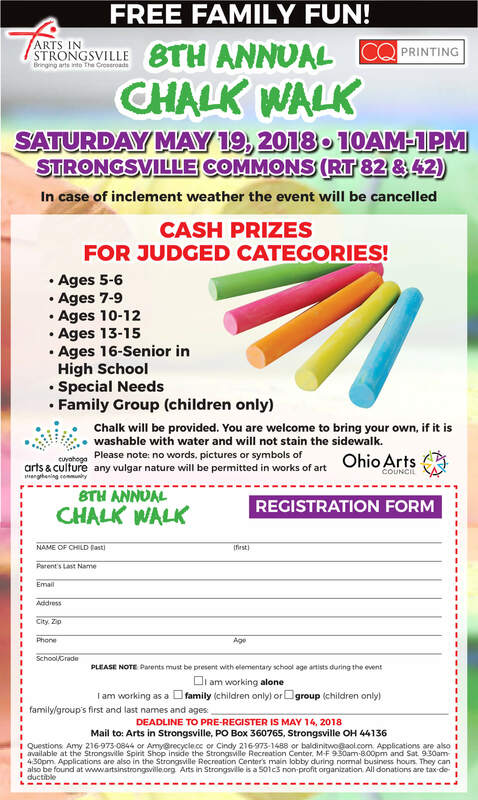 Chalk Walk forms can be picked up at the Strongsville Spirit Shop inside the Strongsville Recreation Center. M-F 9:30am-8:00pm and Saturday 9:30am-4:30pm. Applications are also in the Strongsville Recreation Center’s main lobby area during normal business hours. The forms can be found where all information is kept on the wall across from the front doors of the recreation center. Pre-Registration is encouraged and will ensure a spot for your child at this event. Registration will be available on the day of the event if room permits. Click here to download a Chalk Walk Registration Form. Click here to view/print the Chalk Walk Rules. Since 2010 Arts in Strongsville has awarded three annual scholarships to high school seniors looking to study an arts-related field after graduation. Applicants must be a Strongsville Resident, a Senior in High School, and planning to be a full-time student at a college or institution of higher learning during the next academic year. Applications should be sent to PO Box 360765, Strongsville OH 44136 by Friday March 29, 2019. 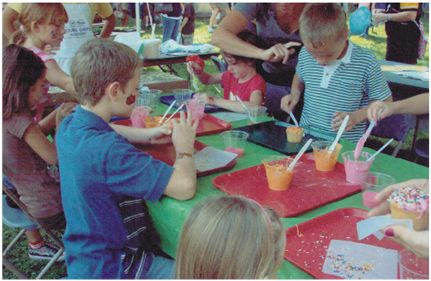 Arts in Strongsville will host its 17th annual A Day at the Chalet, Sunday, September 18, 2016, at the Cleveland Metroparks Chalet Recreation Area, in Strongsville. In partnership with the Rotary Club of Strongsville’s annual Duck Race and KidsFest, Arts in Strongsville is selling ducks. Each year thousands of ducks race through the Rocky River to win cash prizes for their owners. The Duck Race and KidsFest will be held on Saturday, June 4, 2016, from 11 a.m. to 3 p.m. at the Cleveland Metroparks Chalet.